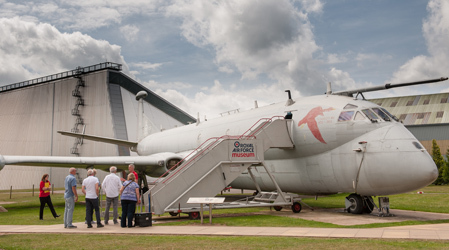 Step on board the Nimrod XV249 and learn about its intelligence gathering role in the Royal Air Force. Gain an insight into the operational history of the aircraft from it's time as Maritime Reconnaissance through to it's conversion into a Signals Intelligence gathering aircraft as well as hear about the crews on board and get to see some of its sophisticated surveillance equipment. As one of only four Nimrod R1's in existence, you will gain a rare insight into the RAF's intelligence capabilities. Nimrod Tours cost £5.00 per person and last 15 minutes (max 6 people per tour). Boarding passes for Nimrod Tours can be purchased in the Visitor Centre. The RAF Museum's Conservation Centre will also be opening its doors to visitors for access to aircraft in our conservation hangar from 12-18 November. 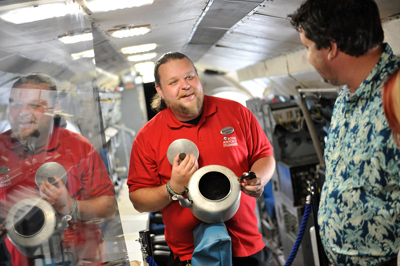 For one week only, visitors will be able to view progress behind-the-scenes being made on a range of aircraft. The Open Week is from 10.15am to 1.00pm and tickets cost £5.00. For more information click here.